Secluded, detached, south facing villa with pool and 3 bedrooms. Stunning views across mountains down to the sea. En-suite bathroom to bedroom 1 with sunken bath. Separate bath/shower room to service the other 2 bedrooms. Very large open plan living room with step up to dining area. Leather 3 piece suite, Satellite TV with UK and German channels, DVD player and radio. Central heating throughout for those nippy winter nights plus a cosy wood burning stove. Electric oven and 4 ring ceramic hob, fridge/freezer, washing machine, microwave, large cupboards, ample crockery and cutlery for 6 people. Baviera golf course is 25 minutes drive away. The pool is open from Easter until 31st October. Notes on accommodation: A cot can be provided by arrangement. Outside: Set in a large garden with stunning views across the mountains. There is a spacious patio beside a private pool (7 metres by 3 metres with depth ranging from 1 meter to 1.7 metres). A barbecue area with sink and water is on the patio together with 4 full sized sun loungers. 2 smaller sun loungers are stored in the shed. Utility Room: Vacuum cleaner, ironing board and iron. Cleaning / Towels / Linen / Maid service: Bath & hand towels plus bedlinen provided. However we ask you to please bring your own poolside towels. Beds will be made up for your arrival and along with towels, changed once a week. If you enquire a more frequent change to linen this can be arranged. Other: Bedroom 3 when not used as bedroom provides a sunny study with sofa and DVD/CD player. Had a wonderful stay in Casa Vick. The villa was very well equipped with everything we needed - even a selection of sun hats! Everything was spotlessly clean and the pool was delightful. There is lots of outside space and plenty of it in the shade, if you wish, at all times of the day with lots of sunbeds and outside seating. The peach and tranquility of the villa was only delightfully interrupted almost daily by the "goat man" and his goats and dogs passing along the road. The area is delightful although a car is definitely required. We had a wonderful meal at El Pilan in the town on our friends birthday and the restaurant even decorated the table for us - a lovely touch! We had a few trips to Nerja - a lovely seaside town with lots of lovely shops and restaurants. We visited with Alhambra at Granada, the drive there being almost as spectacular as the Alhambra itself. Thank you so much for sending in this lovely review. We are very pleased that the effort we have gone to, to make the villa welcoming and equipped with all you should need results in another 5 star review. Pepe, the goat herd gets more mentions from our guests than almost anything else. It is, as you say, a delightful interruption to the day. I wonder whether you stopped at the amazing enormous dam on your journey up to Granada and the Alhambra. This is another spectacle worth stopping to see. We are so pleased that you had a great time and thank you for booking our villa. A lovely villa that had everything we needed. We had a very relaxing time during our stay. The villa was perfect for us, very tranquil with everything we needed to make this a very enjoyable holiday. The short walk into Competa, a beautiful, friendly village was made most days or evenings. The surrounding area is beautiful and we enjoyed trips to local villages and the coast. Thank you for the review. We are so pleased you had a good time at our villa and found everything to your satisfaction. Yes, it is a lovely tranquil spot and within easy reach of the village. We fell in love with Competa some years ago and love our time there. I wonder if your found the 'lost' village of Acebuchal during your travels? We wanted a holiday in real Spain and this villa and this location ticked all the boxes.this villa is 636 metres above sea level and as you can imagine the views are spectacular.The villa is clean and well equipped with 3 bedrooms one being on suite.The outside space is of a good size with a pool together with a barbecue area. The village is approx a 30 minute walk away, but I would recommend taking a car due to the rough terrain track immediately outside the gate.In my opinion a car is essential as it will take you roughly 20- 30 minutes (15km) from the coast road to get to the villa, and you will have to be a confident driver negotiating the twisty mountainous roads, but it is well worth the drive. In closing the owner Mike was very helpful throughout this booking/holiday and we hope to return to return to Competa in the future. Thank you for your kind comments about our villa. We are so pleased that you and your friends enjoyed your stay. I think that one of the benefits we have is the quite large, level and secluded garden and the single story, open plan interior. I have to agree with you that our location, 15 Km into the mountains from the coast, makes a car essential. We have thoroughly enjoyed our stay at Casa Vick. The photos really don't do the villa justice it is a very beautiful traditional villa the pool and the surroundings are very relaxing with everything you need for your stay. The village of competa is wonderful everyone is very friendly and helpful we were very lucky to see a wedding in the village square and this was delight. We loved our meal at the hotelwhich I would recommend as we sat on the verdrander and watched the sunset. The goats that go pass the villa twice a day was a treat for the kids as this was very funny when they jumped on the neighbours wall to pinch the flowers!!! My only negative point would be the third bedroom the bed was ok at first but as the days went by this wasn't the case and also the pillows could do being updated. Thank you Mike for letting us enjoy your villa and I can definatley see us as family or my in-laws re visiting this in the very near future. Hi Nicki, thanks for your lovely review. If the photos don't do the place justice and guests book on the strength of our photos then Wow! that is a compliment indeed! I expect the meal on the balcony of the hotel you mention is the Hotel Balcon de Competa. New managers took over about 18 months ago and they have raised the bar, if you'll excuse the pun. Absolutely everyone mentions the passing goats in the guest book! They are surely an asset to the atmosphere of the place. Your comments on the sofa bed in the study/bedroom are noted and we will have a good look at improving this. We renew all the pillows every two years and they are due when we go back over ourselves in October. So pleased you wish to come and stay again. Many of our guests do. We stayed as a family of four for 18 nights and had a fantastic time. Competa is a lovely friendly village with lots of bars and restaurants. A car is a must with so many things to see and do in the surrounding area. I must recommend a hike up the Rio Chillar, if you intend to go all the way to the waterfall it will take around three hours and slightly less on the return. We would definitely return to the Villa again. Thank you Mike for a brilliant Holiday. We are so pleased you enjoyed your stay at our villa. It is lovely to know that a long stay of 18 nights did not leave you wanting for things to do or bored with just chilling out. Yes, Competa is a lovely friendly and very pretty village with great facilities with fascinating winding streets to explore. We too have hiked up the Rio Chillar, a wonderful experience walking actually in the river all the way and the part through the narrow gorge is amazing. We look forward to your suggested return. Wow! 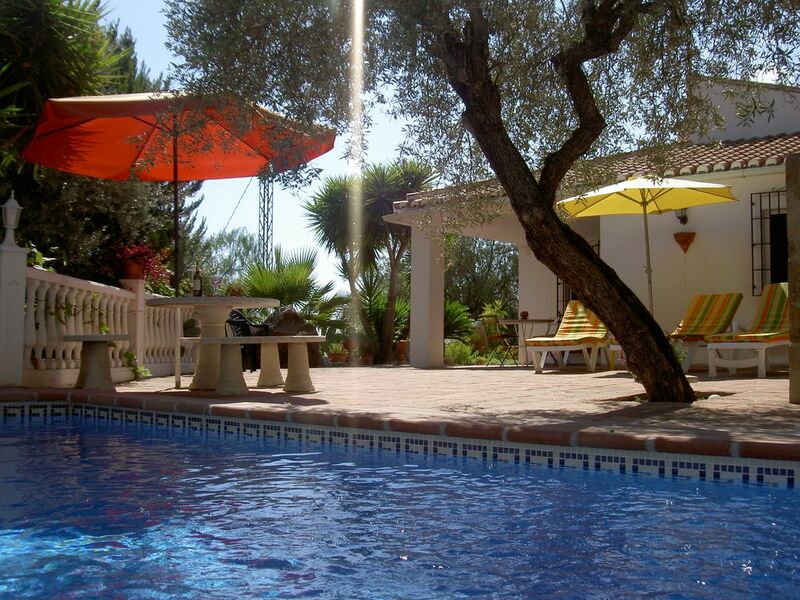 Where to start about a perfect week in this lovely villa on the outskirts of Competa? The home, patio, gardens and pool area were well furnished with everything we needed to start our holiday. The location is private, tucked onto a hillside and although there are neighbours around, they are not close and the home isn't overlooked. We found the location and the home perfect for our need to relax and re-charge our batteries. We spent a large amount of time in the pool as the weather was quite warm the entire week - never a shower or a gray day. We also made use of the poolside BBQ and cooked many of our own meals at the villa. The villa provides everything one would need to enjoy a week in the sunshine. The garden has been beautifully landscaped with flowers, cactus and beautiful palm and fruit trees. In town, we made it to the Saturday market and bought fresh vegetables and fruit - we would recommend this to anyone wishing to support local people and it helped to practice our Spanish. We went to a few spots in town for a cold beer, a meal or for tapas. We would recommend everything at Taberna de la Oscar - went for a lunch and returned a few days later for dinner. Everything there was tasty, fresh and the staff were friendly and gave us helpful suggestions with the menu. We had ice-cold beer at La Taperia on the square, welcome for a hot day. On our final day our last stop was La Esquina De Miguel near the main municipal car park. The tapas were freshly prepared and quite good at a very fair price. We would recommend trying lots of spots in town, they were all outstanding. Thank you to the owners for allowing us to enjoy your beautiful home. We hope to return again in the near future, and would highly recommend this villa for others seeking an escape from life's daily grind. We'd consider this one of our favourite holidays so far. Well Ruth, thank you for the lovely comments about our villa! We are so glad you enjoyed your stay. You are quite right about the different places in town, it really is a friendly place and the standard of food seems to run from very good to outstanding. Most of the shops have the same friendly attitude and high standard. Pleased you made use of the BBQ and were able to make full use of the pool. We are so pleased that you fell in love with our villa and the village of Competa. Torrox costa is nearest beach about 15 Km drive taking around 20 minutes. It provides a clean beach and long promenade with many restaurants and bars. The attractive and busy resort of Nerja is a further 10 minutes drive away. Malaga airport is the nearest, 1hr 15 minutes by car. Granada is an alternative with a drive time of around 2 hours. The use of a car is really essential if staying at our villa. Competa is 2km away taking 4/5 minutes by car or 20 minutes on foot. A super area for mountain walking, pony trekking or just whiling the time away. Booking Notes: Please contact owner. Changeover Day: Changeover days are usually Saturdays but we are quite flexible and are also willing to accept part weeks for bookings. e.g. from 4 days to however many required. Notes on prices: Prices shown are per week in UK pounds. However, part weeks and extended periods are available. Discounts are available on lets of more than 2 weeks.